On Monday the CharIn Alliance (the organization behind the Combo Charging System, a.k.a. CCS) held its first North American conference in Fremont CA. The location was a Marriot Hotel directly across the highway from Tesla’s factory in Fremont, a fact that seemed pointed in the direction of trying to catch Tesla’s attention. While that wasn’t explicitly said, several of the presenters made obtuse references to the company across the street. The case was made strongly and repeatedly, it would be immensely useful for there to be one DC Fast Charging standard, that would be an open standard implementable by multiple corporations, that would be built by partnered charging networks rather than owned by manufacturers, and that would be integrated with the distributed management system being developed for the electricity grid. There was a lot to digest from the conference – and it will take several postings to go through this. Something to start with is CharIN’s membership, who was in the room, who was absent, what CharIN is about, and the Combo Charging System versus other DC Fast Charging systems. CharIN (Charging Interface Initiative) is an association founded by a collection of German car companies, plus Mennekes, and is focused on promoting the Combo Charging System as the best DC Fast Charging system for electric cars and electric buses and so forth. The DC Fast Charging field is unfortunately fragmented to the detriment of all electric car owners. We can’t simply drive up to an electric car fast charging station and be certain that it will work with our car. We may not have membership with the owner of the station, it may use an incompatible fast charging protocol, etc. 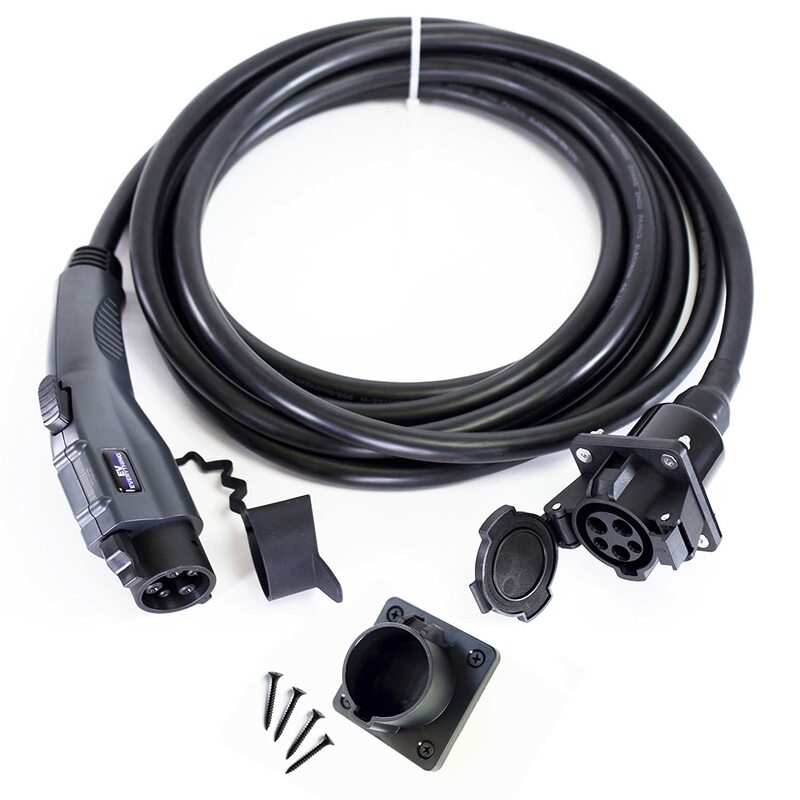 That’s the basic idea – a car supporting the CHAdeMO DC fast charging standard cannot utilize other DC fast charging systems. 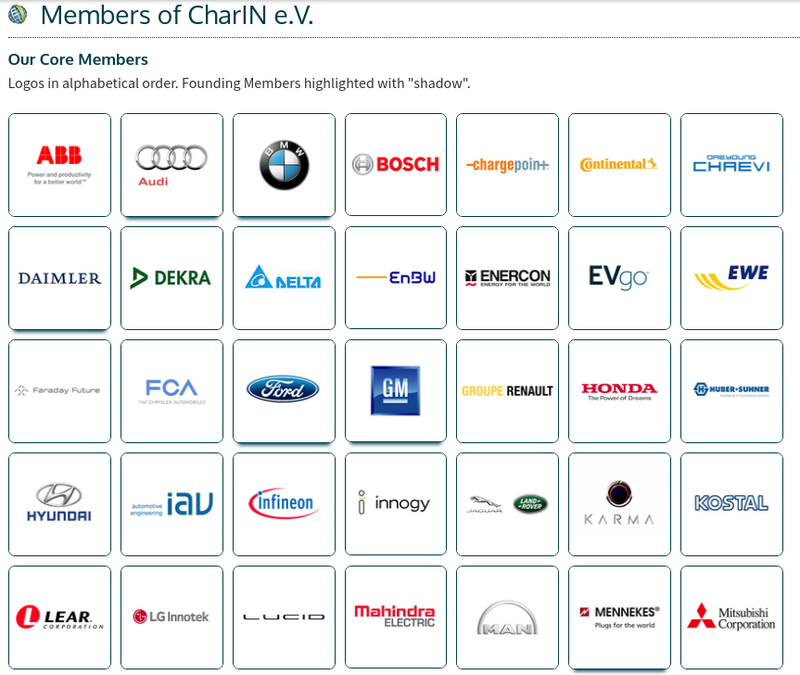 The CharIN alliance has membership from 16 of the major car manufacturers. That includes Tesla Motors, most of the Japanese car makers – which one might find surprising given the prevalence of CHAdeMO among Japanese automakers – and even Energica, the electric motorcycle maker from Italy. The most prominent company missing from the membership list is Nissan. That company has steadfastly stuck with CHAdeMO. CHAdeMO was developed in the mid-2000’s by TEPCO, the Tokyo Electric Power Company, and first deployed in Japan in 2008. 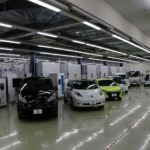 The CHAdeMO network in Japan is ubiquitous and one cannot blame a Japanese company to be blinded by that fact into thinking CHAdeMO is the best solution for electric car fast charging. Another prominent automaker – Tesla – is a member of the CharIN alliance but seemingly did not participate in the meeting, despite the location being extremely convenient for Tesla. No Tesla representatives were among the panelists and it wasn’t clear whether any Tesla employees were in the room. There were representatives from both Lucid Motors and Future Faraday, however, represented in the panels. 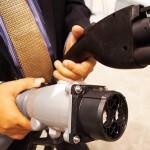 The Combo Charging System was developed by primarily the German and American car companies beginning around 2009-2010. 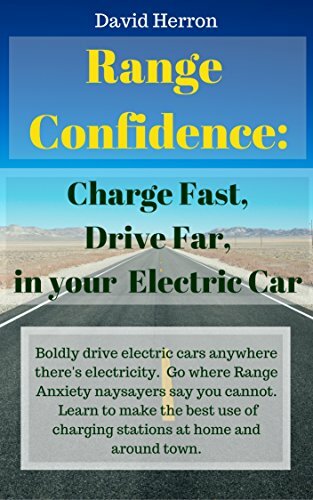 I have published lots of details on CHAdeMO, Combo Charging System, the Chinese fast charging system, and Tesla’s Supercharger system, elsewhere . 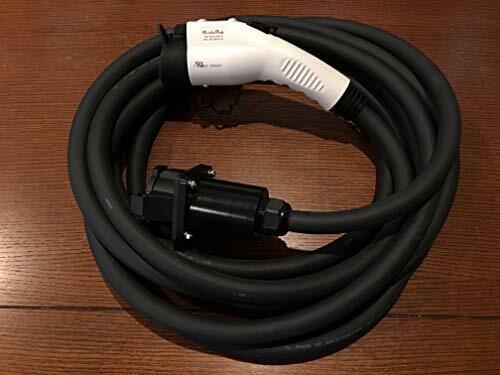 The SAE could have adopted CHAdeMO for the worldwide standard for DC Fast Charging. It was an existing system which had proven itself in field usage in Japan. However there were technical issues – the SAE had the idea to integrate DC Fast Charging with Smart Grid protocols, and sought to base its Fast Charging system on HomePlug PHY. I’d seen indication this decision was made at a CARB meeting in Sacramento in September 2009, but in yesterday’s conference the presenters claimed the decision was made at a discussion held during the PlugIn 2010 conference in San Jose. Again, all kinds of details are in the page linked above. Presenters during the conference showed an open architecture for electric car charging that is highly compelling, and I hope it gets implemented in some form. Charging handled by either J1772-based AC charging, or SAE’s Combo Charging System for DC Fast Charging. The car is automatically recognized by the charging station, automatically identified to charging network operators, no need for a membership card, and the possibility of roaming between charging networks. Charging rate high enough to recharge in a very short time. Open architecture built with open standards and deployed by multiple charging networks that are not owned by car manufacturers. Electric buses and large trucks charged by the same system. .The second point is interesting since there’s a small hurdle to using public charging because of the necessity to get membership in a charging network. It’s not like when we buy gasoline using a credit card at a gasoline pump. Electric car charging generally requires membership in a charging network, and there’s the issue of being required to carry membership cards, and having to maintain membership with multiple networks because of the fragmentation in charging station ownership. The proposed solution is a data communications protocol, IEC 15118, which runs over the charging cord. California made a statement in October 2016 supporting 15118. 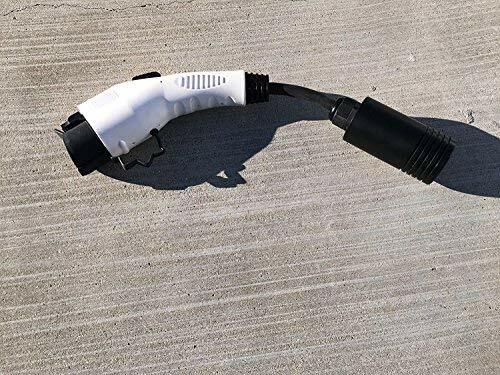 It runs over the pilot signal wire in the charging connector and offers a number of higher-level control capabilities. At the CharIn meeting I learned an important feature is that each electric car will have a cryptographically signed identification certificate that definitively identifies the car and manufacturer. A similar certificate is required in a different protocol, IEEE 2030.5, that was designed for use with solar inverters and other distributed energy resource (DER) assets. In that case the certificate identifies the DER device to electric utilities, and is used to greatly improve the security of the electric grid by robustly identifying each device. 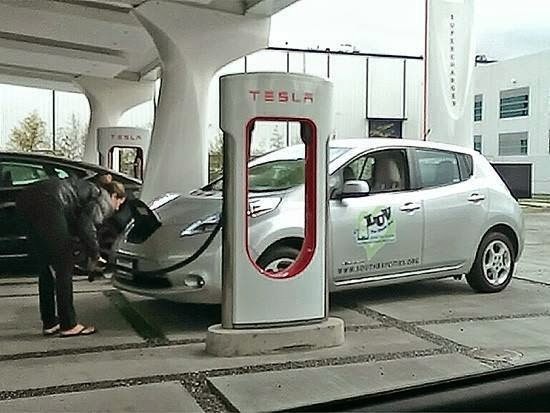 What it will do for electric cars is to robustly identify the car to the charging station. 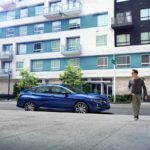 The charging station can then relay the identification to the charging network, and then — without using a membership card — the car will be automatically recognized and either approved or disapproved to start a charging session. Additionally, they’re working on a “Roaming” system allowing the charging networks to cooperatively authenticate each others members. That is an interesting idea that’s akin to how we use ATM machines. We aren’t limited to using the ATM machine belonging to our bank, we can go to almost any ATM machine and just use it. That ability is determined by which ATM networks your bank belongs to, and the ATM network supported by a given ATM machine. Behind the scenes these ATM networks serve to connect banks and ATM machines while giving the customers a seamless user experience. ChargePoint launched an effort like this back in IIRC 2013, but that effort floundered when their partner (ECOTality/Blink) went bankrupt. Maybe this time will work out better. The Open Standard part is an interesting stand to take, especially as a couple of the presenters talked about a preference for “partnered charging networks”. In the past a statement about Open Standards based fast charging would be used by CCS proponents to shut down CHAdeMO adoption. For a long period CHAdeMO was not blessed by a Standards agency, only by TEPCO. 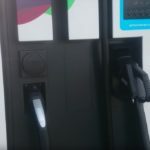 But the CHAdeMO Alliance did get it approved by a committee at a major standards association, and CHAdeMO is part of the IEEE 2030.1.1 standard. Instead those comments were focused at Tesla and its proprietary Supercharger network. Yes, the Supercharger network does everything we need, it’s ubiquitous and Tesla is doing a great job of ensuring Supercharger stations are at useful locations. 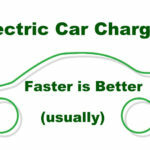 But … is a manufacturer-owned charging network the best choice for consumers? Should there be a manufacturer-proprietary charging network owned/operated by every electric car company? I don’t think so, and the presenters at the CharIn meeting made it clear they don’t think so either. That would be a massive waste of macro-economic resources to have duplication between charging networks. What’s best is to put all the wood behind one arrow (and yes I did formerly work for Sun Microsystems who used that phrase in its advertising). That is, the macroeconomics say it’s better for all investment in DC Fast Charging to be focused on one charging standard. As it stands we have three competing standards – with investment dollars piling into two pools. One is the combined CCS/CHAdeMO infrastructure, and the other is the Tesla Supercharger, with a third pool being China’s GBT system. The point is that growth of the charging network would be faster if it was all going into one pool of charging equipment. That wouldn’t require all charging equipment to be owned/deployed by one company. But all charging equipment would be required to conform to a single standard. 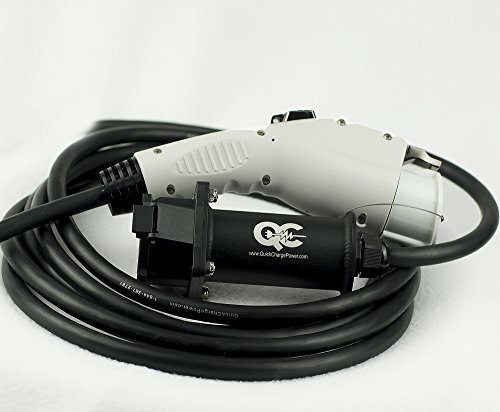 This works in the fossil fuel refueling industry, where there are multiple providers of refueling pumps, but one standard for nozzles that work in every car and motorcycle. Taken together all those attributes would combine into a compelling system that could accelerate electric vehicle adoption. We would have the ability co charge at essentially any charging station, have payments routed back to whatever charging network we belong to, have a reasonably fast charge rate (350 kW or more), and no longer have to worry about finding compatible stations.